If Dr. Rey Agana’s self-published book becomes a hit, we might be hearing a lot more Germans saying “Maayong buntag!” soon. Dr. Agana, a Filipino linguistics scholar based in Berlin, Germany, recently launched a self-published book which aims to introduce the Binisaya (also known as Bisayan) language to Germans. The 200-page book titled “Binisaya: D*e Verständigungssprache in den Visayan und Mindanaoregionen der Philippinen” (Binisaya: The Language of Communication in the Visayan and Mindanao regions of the Philippines) contains structured lessons on Binisaya grammar and conversational dialogue. Dr. Agana says that he developed the book due to strong demand from German spouses, second-generation Filipinos living in Germany, as well as German volunteers and development workers undertaking projects in the Visayas and Mindanao regions of the Philippines. He also adds that Binisaya is experiencing a resurgence in the Philippines, with the proportion of Filipinos who identified themselves as native speakers of Bisaya or Binisaya having doubled to 10 million in 2010 from 5 million in 2000. Agana has made a mark in the academic field as former teacher of Tagalog courses at Humboldt University in Berlin. He has also previously written textbooks on learning basic Tagalog for German audience, as well as a book on the role of rumor in informal learning. He is also a prolific writer of various articles in English and German. The scholar is also active with Projekt Bayernallee which provides intercultural integration courses through Tagalog and German courses since 2009. The Philippine Embassy in Berlin’s Chargé d’Affaires Mardonel Celo D. Melicor thanked Agana for his donation and welcomed his initiative to reach out to German speakers interested in the Binisaya language. 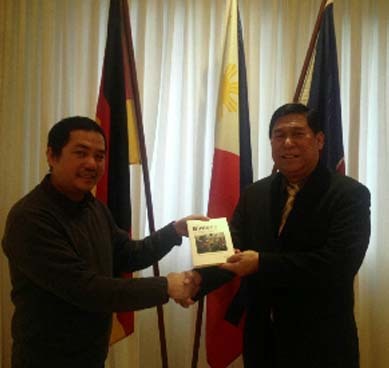 Melicor, who received an advance copy of the book from Agana himself, said he is hoping the book would help strengthen bonds of German-Filipino families in Germany with their families in the Philippines. He also noted that a German has once written an e-book called “Nagtuon kog Binisaya” for those who want to learn the language. There are an estimated 57,000 Filipinos currently residing in Germany, according to the Commission on Filipinos Overseas.